If you are looking for customised and very effective training interventions in the area of Service Management - Anand is the right person to talk to. Run workshops across 15 countries - Australia, Japan, South Korea, China, Taiwan, Philippines, Hong Kong, Singapore, Thailand, Malaysia, India, Sri Lanka, Seychelles, UK, Germany, and the USA. Impacted organisations such as Oracle, Vodafone, Novartis, Deutsche Bank, Accenture, Aon Hewitt Consulting, Texas Instruments, Avaya, Philips, and Carl Zeiss. PhD in Business Studies from the University of Buckingham . BTech from the Indian Institute of Technology Madras . After working with an international hotel chain (The Taj Group of Hotels) for about 6 years, and a leading IT major (Wipro Corporation) for 3 years, Anand has been on his own as a consultant trainer since 1994. 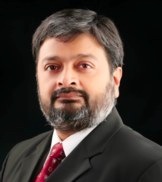 Anand combines corporate work with teaching; he has been teaching courses on Service Management at the Indian Institute of Management Bangalore since 1997.